“I think I hit a rat.” Words that I really, really wanted to hear as Matthew mowed the meter-high brush under a wood frame propped up in our backyard. He finished off the section, stopped the mower, and we headed back to investigate the burrow. The remaining two small (intact) critters nosed around as we tried to figure out if we were dealing with rats. I went inside for a pair of tongs and a plastic bowl to put the critters into while we figured out what they were. Wads of grey fuzz fell to the ground as I scooped up the first critter. It would have fit in the palm of my hand; guesses ranged from squirrel to chipmunk. We weren’t certain if the mower had gotten the mother or a sibling, so we gathered them both up (still oblivious as to their species–they were missing the telltale stripes of a chipmunk and tail of a squirrel) and I headed to the Internet to try to figure out what they were. While Googling for “chipmunk orphan,” I had an epiphany. We’d seen a brown rabbit in our headlights while driving up the drive in the past, and these were the size of full-grown chipmunks, but their eyes weren’t even open yet. They were rabbits! 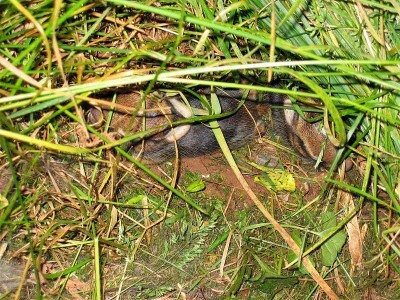 Little baby brown rabbits! Judging by their size (I weighed the babies in at 57 and 58 grams when I was trying to figure out what they were), they are just shy of a week old. After some hemming and hawing about hand-raising rabbits and figuring out that the mother was probably somewhere off in our backyard avoiding us, I put the nest back together as best I could and put the baby rabbits back into it. Hopefully, the mother will come back and care for them in the remade nest. My thanks go out to [Heather](http://www.livejournal.com/users/phaeba/) and her extreme Googling skills, as she fed me useful information while I tried to figure out what was living (and breeding) in my backyard. This entry was posted in Live and tagged rabbits. Bookmark the permalink.